When it comes to focal lengths, it seems that many photographers get very confused by “equivalent focal length” and “field of view” jargon that is often used to describe lens attributes on different camera sensors. To help fully understand these terms, I decided to write a quick article, explaining what they truly mean in very simple terms. What is the true focal length of a lens? This one is extremely important to understand. Focal length is an optical attribute of a lens, which has nothing to do with the camera or the type of sensor it uses. The true focal length of a lens is typically what manufacturer says it is on the lens. 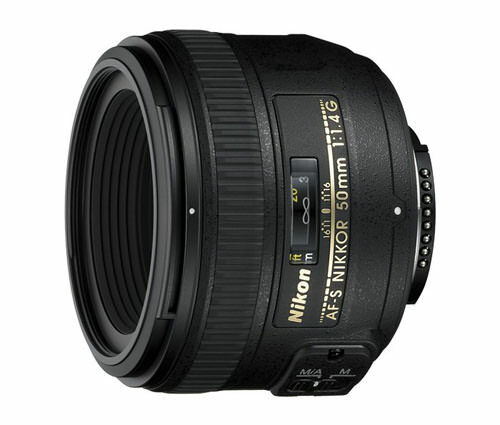 For example, the Nikon 50mm f/1.4G lens (below) has a true focal length of 50mm, irrespective of what camera you use it on. The “field of view” (which is sometimes wrongfully called “angle of view”, as explained below) is simply what your lens together with the camera can see and capture from left to right, to top to bottom. If you are shooting with a DSLR camera, the field of view is typically what you see inside the viewfinder. Some DSLR cameras, have less than 100% viewfinder coverage, which means that what you see inside the viewfinder is actually less in size than what the final image will be. For example, if you shoot with the Nikon D90 DSLR that has 96% viewfinder coverage, what you see inside the viewfinder is going to be about 4% less than what the camera actually captures. Hence, the actual field of view is always what the camera captures, not necessarily what you see inside the viewfinder. The top-left 70mm image looks almost “wide”, while the 400mm image shows a much greater magnification with a much narrower field of view. As you can see, 84 degrees is very wide when compared to 8 degrees. That’s why you can fit a lot of the scene when shooting with a 24mm lens, while a 300mm lens allows you to capture a narrower, but much more magnified portion of the scene. The main difference between the angle of view and field of view, is that the former is an attribute of the lens, while the latter is the result of both the lens and the camera. For example, the above angle of view of 84° for the 24mm f/1.4G is only for a full-frame camera. Once mounted on a camera with a cropped/APS-C sensor, the field of view, or what you see through the camera actually gets narrower to 61°. Nikon publishes two different numbers for angle of view for lenses – “Maximum Angle of View (DX-format)” and “Maximum Angle of View (FX-format)”. In reality, the actual physical characteristic of the lens (what it sees) does not change. As explained below, the size of the sensor simply crops part of the frame, which results in a narrower “field of view”. 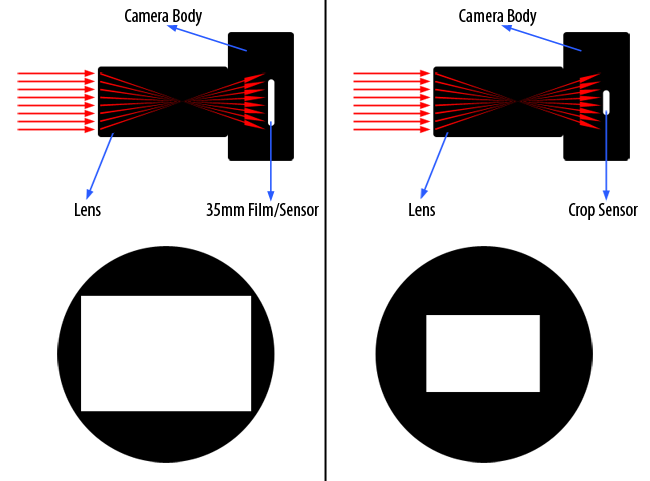 As you can see from the above illustrations, the 35mm film/sensor cameras capture a large area of the lens, while the smaller sensors (also known as “cropped sensors”) capture mostly the center. Note how the light enters the camera chamber in exactly the same way in both illustrations, but the smaller sensor is only able to capture a certain portion of it, while the rest of the light falls outside of the sensor. The term “cropped sensor” can be confusing, since “cropping” an image is often associated with cutting it. Once again, in this case, there is no cutting – the light rays from the edges of the lens just overshoot and do not make it to the sensor. Manufacturers knew about this “overshooting” process when they designed smaller sensors, so they started producing lenses specifically designed for cropped sensor cameras to make them cheaper. Nikon calls them “DX”, while Canon calls them “EF-S”. Basically, the lens itself passes through a smaller image circle and by the time it gets to the sensor, not much of the circle is actually wasted. Think of it as the right part of the above illustration, except the circle is much smaller. Obviously, lenses like these do not function as they should on full-frame/35mm cameras – only half of the scene will actually make it to the sensor. Nikon full-frame cameras are programmed to recognize DX lenses and will automatically decrease the image resolution, while the Canon EF-S lenses will not function on full-frame cameras at all. How do two cameras with different sensor sizes have the same image resolution? For example, both full-frame Nikon D700 and cropped sensor Nikon D300s have 12.1 Megapixels while having different size sensors. This is because the Nikon D300s camera has much smaller pixels (and hence, higher pixel density) compared to Nikon D700 – that’s how 12.1 million pixels are able to fit on a smaller sensor. What this essentially means, is that the smaller sensors with smaller pixels enlarge the center area of the lens more in this case. If a lens is not of very high quality and is not able to resolve fine details, the images might appear less sharp on cropped sensors. Let’s now get back to the term “equivalent focal length”. I’m sure you have seen manufacturers claim something like “The 28-300mm lens has a field of view equivalent to a focal length of 42-450mm in 35mm format”, which is a correct way of saying it. Others may say something like “the lens focal length is equivalent to 42-450mm on DX sensor”, which is an incorrect way of saying it. As I have shown above, in relation to the camera sensor, the focal length of the lens never changes – only the field of view does. Saying something like “my 28-300mm lens on my Nikon D90 is like a 42-450mm lens” is incorrect for this reason. Where do these larger numbers such as 42-450mm come from? Let’s now look into the crop factor and how these “equivalent” numbers are actually computed. By now you understand what “equivalent focal length” truly stands for and how the smaller sensors ignore the larger circle area. Let’s now talk about the crop factor – the term that manufacturers and photographers often use to describe camera sensors and to calculate the “equivalent focal length”. You might have heard people say something like “Nikon D90 camera has a 1.5x crop factor” or “Canon 60D has a 1.6x crop factor”. The term “crop factor” came up after smaller sensors were invented to make it easier for people to understand how much narrower the field of view gets when a lens is used on a camera with a small sensor. Manufacturers had to somehow explain how an image on a smaller sensor camera looks enlarged or “zoomed in” compared to 35mm film. If you take the sensor area of a full-frame sensor or 35mm film and compare it to a cropped sensor, you will be surprised to see that the former is at least twice larger than the latter. For example, the Nikon full-frame cameras approximately have a sensor size of 36mm x 24mm which gives us a surface area of 864. Cropped-sensor cameras like the Nikon D90, on the other hand, have an approximate sensor size of 24mm x 16mm, which is around 384 in surface area – a whopping 2.3 times smaller compared to Nikon D3s! But when it comes to focal lengths, you do not use the surface area of the lens. The crop ratio is computed by taking the diagonal of the full-frame sensor, divided by the diagonal of the cropped sensor. Now you will have to remember some math. Remember how to compute the diagonal? Here is the formula in case you forgot it: √(X² + Y²). The full frame camera has a diagonal of 43.26 (square root of 1296+576), while the cropped sensor cameras have an approximate diagonal of 28.84 (square root of 576 + 256). If you take 43.26 and divide it by 28.84, you get 1.5 – the ratio of the full-frame sensor diagonal to the cropped sensor diagonal (these numbers are rounded – the actual ratio is a little bit higher, around 1.52). What do you do with this ratio? You multiply it to get the “equivalent focal length”. For example, the Nikon 24mm f/1.4G lens has an field of view equivalent to approximately 36mm when mounted on a cropped sensor camera like Nikon D90. What this means, is that if you took a 24mm lens and mounted it on a cropped sensor camera, then took a 36mm lens and mounted it on a full-frame camera, you would get about the same view. If you put it the other way, to have the same field of view as the 24mm mounted on a full-frame camera, you would need a 16mm lens on a cropped sensor camera. For example, if you were standing from one spot and could fit a house in your frame using a 24mm lens on a full-frame/35mm camera, to be able to fit that same house on a cropped sensor camera, you would need to have a much wider lens with a focal length of 16mm. Hope this clears up the true definition of the above terms for those who do not understand them well. If you have any questions or comments, please post them in the comments section below. Thank you for this excellent post! One thing I was wondering a while ago was how to compare binoculars with camera lenses. The binocs always advertise “6x magnification” or something like that. What I found was that a 50mm lens is supposed to be pretty much what the eye sees, so is effectively 1x. Every additional 50mm is an additional magnification. I wanted a pair that would do better than my Nikon 18-200 on my D300. I figured that a 200mm lens on a DX sensor gives an effective angle equivalent to 300mm focal length on 35mm, so should be the same as a 6x pair of binoculars. I never actually had someone who understood both validate my thought – can you say whether that conversion makes sense? After reading your post, I realize I should have just looked at the angles (since I think both lenses and binocs publish those). Ben, you are most welcome! Sir Nasim, you are so generous of knowledge. your article is so great, it will go a long way to many people all over the world needing to understand focal length, angle of view and camera sensor. Many thanks to you. Wish you a happy life. Sir Nasim, I have 50mm 1.8g on D7000 (crop sensor) body, now I attach wide converter 0.7 on my lens so in my calculation it turns out I have a field of view of 52.5mm which means I get nearly a full frame sensor field of view on 50mm lens. If my calculation is correct do I still get same quality photo on full frame DSLR? Any word on the “lens breathing” issue with some zoom lens (like the Nikkor 70-200 VRII) ? Del-Uks, I knew somebody would have asked this question! :) The lens breathing characteristic has to do with focal length shifts due to the optical design of the lens to accomplish two things a) to have a shorter maximum near focus range and b) to not move external lens elements while focusing. It is just a different way the lens focuses, which is why the focal length is accurate at infinity. Hi Nasim, excellent info. can you pls. clarify as to why 85mm is called a portrait lens(mounted on FX) ? What would i do wrong in terms of image quality if i do the same with a 50mm lens? I have seen a lot of beautiful images on your website with 50mm… but it seems several photographers are pretty strict about using 85mm for portraits? thanks. Sekhar, the 85mm is called a portrait lens, because that’s what it is intended to be – for shooting portraits. It renders the background (bokeh) better than any other Nikon lens and the really large aperture of f/1.4 allows to isolate subjects, while keeping them sharp in the foreground. The Nikon 50mm is also superb, but it is certainly inferior in terms of wide open performance + rendering of bokeh. I personally like both lenses and consider the 50mm f/1.4G to be a great value, given its price and performance. Nasim, Yes, only after coming across your articles, i could make up my mind and purchased a 50mm f/1.4G for my d90. No doubt I see clear-cut difference from other lenses with smaller apertures. I guess, I will have to try the 85mm myself and see the difference, but it is too pricey ! I always wondered if the focal length mentioned on an EF-S lens is the real focal lenght or already the equivalent focal length? I guess it’s the real focal length,but I’m still not fully sure. Thank you Coby! The focal lengths on lenses are the real focal lengths, not equivalent ones. So if you are looking at the Canon 18-55mm lens, for example, the equivalent “field of view” is going to be that of a 29-88mm lens. Can you help me understand how the image is magnified in a DX versus a FX? I understand that the DX only captures part of the image capable by the FX, but why the enlargement of the subjects? If I have a photo on my desk, and I just cut around the outside perimeter of the photo to make it smaller in size, the subjects within my photo (ex: flowers) do not change in size, so how does this happen in the camera of a DX sensor? Something simple I am missing here I am sure bit I just cant see it yet. Does the DX camera electroniaclly strech the image out to fill up a 35mm sensor size equivalent after the phot is taken? Is that how the magnification happens? If so, how do you not lose resolution by doing this (like photoshop cropping)? Thanks, hope to hear back! Francis, an image is not magnified in DX versus FX – it just gets cropped. Think of it this way – an image is cropped and then because there are more pixels on DX, you get a similar resolution as FX. Because of this, the pixel size on DX sensor is much smaller than on FX, which is why you also get less dynamic range. There is no real enlargement happening here – all it is is physical (not software) cropping. That’s why the term “crop factor” is used. Have you had a chance to thoroughly read the article? Take a look at the last image – it will be easier to understand the concept. Thanks Nasim for taking the time to respond, it did help! Can I just add—try and think of the image being shrunk by the “lens”onto the 1.5/6 factored sensor to fit it “whole” then we get given the whole sensors worth as our image. It’s pretty confusing, I [from my old film days] still have the 35mm eye but have to stop and recalibrate. The best thing ever would be someone brings out a 17-80 1.4 zoom, all the angles are covered. After reading this, I’m not sure about purchasing 50mm 1.4G to my D300, should I go for the 35mm 1.8G instead? If the pics doesn’t get as good as if I had for example D3x/D3s I mean. Something about “cropped making the images less sharp” made me think… Is the sensor too small in my D300 to get the most out of 50mm 1.4G? I’m a student and therefore it’s a big deal to me financially, I want to be positively sure before I get the glass. Eli, if you have budget issues, then definitely go for the 35mm f/1.8G instead of 50mm f/1.4G. I have the same question as to what I want to buy for my D7000. My cousins bought 50mm f/1.8. You mentioned it in one of your articles that the 50mm f/1.8 does not really work well with some DX camera. Do I really have to go for the large aperture (50mm f/1.4) or get the 35mm f/1.8? I want to have great pictures in low-light, disco light setting. Thank you very much. And more power to you! Detailed good explanation in simple terms! kudos :) I am a beginner and going to make my first dslr purchase in a week. Decided the camera (D90)! Lens wise, I did read your other threads and found 50mm f1.8 and 35mm f1.8 to be very useful to buy (eventually will buy either one of them). I also read the kit lens pros and cons. My question here is, d90 body costs SG $1180 (free – 18GB card) and D90 kit (with 18-105mm) costs SG $1480 (free – 8gb card, 1 Tripod, cleaning kit, nikon bag, nikon travel bag). Is USD $230 worth for the kit lens with freebies or should i have to just buy the body with one of my preferred prime lens. I mostly would like to take portraits, landscape in my point&shoot. Balaji, I would get the kit lens together with a prime lens. Hi, I found your article very informative and clear; however, I do have one question. I just bought a D700, my first fx camera and have been using it with my old dx lenses. I am currently looking for an fx lens to shoot with but the whole crop factor thing has me confused. My question is this, the focal length of an fx lens on an fx sensor the same as a dx lens on a dx sensor? So if I like my 24-85mm dx on my D100, would I get the same with 24-85mm fx on the D700? What an useful explanantion about focal lens, picture angle and crop factor. Have to say thanks.. I am a beginner and just bought D300s and found great of the explanation. 1. Might the image of ( D300s+ Nikon 24-70 ) be less sharp than (D-700 + Nikon 24-70) ? 2. is that ( D300s + FX lense ) more sharp than ( D300s + DX lenses ) ? Appreciate if you could advise since I am considering to invest more to FX lenses ( 14-24 and/or 24-70 and/or 70-200 ). I just bought Nikon DX 18-200 mm and Tokina 11-16 mm/f2.8 as starting point). First of all congratulations for the well-designed website and the information it contains. I find it very helpful. I’m about to buy the nikon d5100. However my “problem” is to what type of prime lens should i get. Either the 50mm 1.4G or the 35mm 1.8G. In terms of budget there’s no issue. I’m between of these two lenses as I intend to take photos mostly at home, people portraits (close-ups and some distance), family photos as well as street photos. I do not intend to change lenses frequently so I’d also consider sth to keep it for a long time before I upgrade to another category. I’d appreciate it to have your advise on this and under these types of photo wwhich lens would add the maximum of value according to the use i plan to do. I would like to congratulate you on a well informed article. Very simple in explanation and easy to follow. Thank you for your feedback Peter! As I notice you did either not read or not understand this great article. 50mm is always 50mm, it gives the “equivalent perspective” of an 75mm on full-frame, but it is still 50mm. The working distance, if for example you were to take portraits, has to be further away because there is less sensor to make a wider picture, and that is why some people claim the “mm” difference. Just concentrate on the angle of view and remember to understand what “equivalent” means. Just came across you site while searching to understand about the lens.I recently bought a Nikon D3100 and planning to but extra lens to capture some family pictures at parties. Should I go with 35mm or 50mm or 85 mm lens? Which lens would have the ideal focal length to cover indoor events without losing the picture quality? Thank you for your effort in writing this article. First of all, congrats on the excellent explanation. I just want to clarify one doubt. Suppose I’m 10m far from my subject and I take a picture with a 50mm lens mounted on 35mm sensor camera. To acquire the same image with an APS-C sensor (let’s say 1.5 crop factor), I’d have to use the same 50mm lens, and take the picture 15m away from the subject. That is taking a picture with a 75mm on 35mm is not the same as a picture with a 50mm on 1.5 crop factor APS-C camera on the same distance. Just to let you know that I am also waiting for an opinion of yours on another article… please reply if you got time…. Thank you for your content on line… seriously since the day, I have found your website, I didn’t need to keep hunting around…. Tanks for this great article and the even greater site. there’s still a thing though which i don’t understand. Since I’m planning on buying the d7000 i wonder about the 100% viewfinder and the crop factor. Ok, the crop factor determines the actual angle of view on the final picture. But what do I see in the view finder with an 50mm lens, for example??? The angle of view of the final picture will show an equivalent of 75mm. Will the viewfinder show the same 75mm or will it show 50mm??? This is a very good article and I have learn many things from your site. I have one question only is a 12-24 mm wide zoom lens will perform better also on a dx lens like d90? Im going to use it for landscapes. Is your diagram showing the 35mm and cropped sensor incorrect? More specifically, with the lens focused at infinity, shouldn’t parallel light rays entering the camera intersect or converge at the image plane, i.e. the sensor? The diagram shows them converging in the middle of the camera. This is one of the best, easy to read explanations of the crop factor. I use this general rule for handholding without lens stablization. 50mm lens = 1/50 or faster shutter 200mm lens = 1/200 or faster shutter. With the crop factor figured in, the rule would still be the same because the lens is not becoming longer, just cropping, correct? 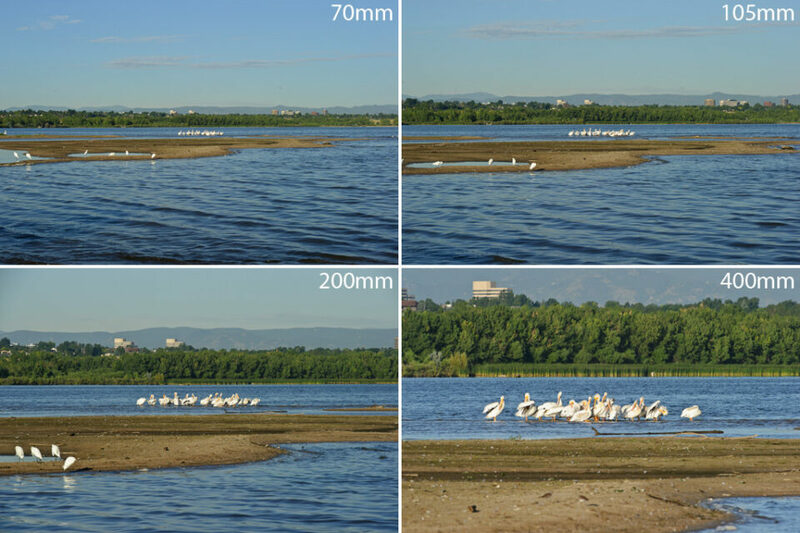 Taking a photo with a 300mm lens on a 35mm is said to be equivalent, in FOV terms, to a photo taken with a 200 mm lens on a APS-C camera (crop factor 1.5). What i would like to understand is if that equivalence exists in terms of IQ aswell. Saying otherwise, giving the same shot conditions (aperture, exposure, lights conditions, object distance etc) and quality of lenses used, the level of details captured with a 300mm on a 35mm shoud be”exactly” the same of those captured with a 200mm on a APS-C (if cameras have same resolution too, saying 24MP) ??? or the equivalence is only in terms of FOV (field of view captured by sensors) and not also in terms of IQ (image quality)??? The image area taken with a 200mm is on an APS-C is relatively the same at that of a 300mm on a full frame sensor. If you want to see the image size of the 200mm on a full frame sensor, but on a cropped sensor then all you have to do is increase the distance from the camera to the subject. This will give you the same FOV as a 200mm on a full frame sensor. The FOV will now be the same, but the DOF will be different due to the increased distance. Just adjust the f:stop to compensate…if this is a problem. Thanks for this excellent post. It answered lot of my doubts. But I still have a question. A lot of people commented elsewhere that the Nikon 35mm 1.8G DX lens would have an equivalent focal length of 50mm on a DX camera (like the D5100 or D90) and, the Nikon 50mm 1.8G which is an FX lens would have an equivalent focal length of 50mm on an FX camera and 75mm on a DX camera. Why the 35mm DX lens does not have an equivalent focal length of 35mm on a DX camera? This is actually a good question and would love to see it answered. Anyone to bring some light on this? With all this being said in this article. Should DX lenses only be used on DX cameras? This article provides a nice clarification on crop factor. But, I think some of your statements about angle of view may be misleading. Just as focal length does not change, neither does the angle of view. Only the field of view does, due to the crop factor. It is crucial to distinguish “angle of view” and “field of view”. 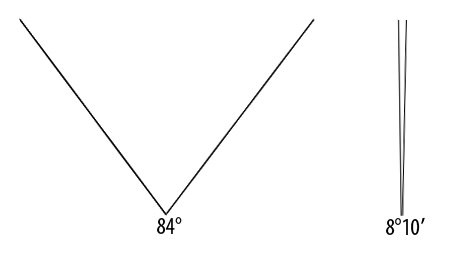 Angle of view refers to the number of degrees projected by the lens as a cone back to the sensor. This angle does not change, regardless of crop factor. The field of view is the area within the projected circle captured by the sensor. Your diagram shows this well: the circles are the same (since the angle remains the same), but the rectangle of the sensors are different sizes. No, the *angle of view* remains the same 84° of a 24mm lens. Yes, you do get “the same view” in terms of *field of view*, but there remains a critical difference: the amount of visual distortion. Since 24mm “squeezes” 84° of the scene onto the sensor, there is more distortion than when a 36mm “squeezes” 62° onto the sensor. For example, the portrait lens length of 85mm (full-frame) is preferred because it renders faces as we see them. A 24mm lens gives us big noses. With a 50mm or a 58mm lens on a DX (AP-C) camera, the sensor captures a *field of view* similar to the 85mm (full-frame), but the angle of view remains that of a 50mm. Hence, a 50mm on a DX is still not quite optimal. James, you are absolutely correct! I take the blame for using the two interchangeably, because I thought it would make sense for beginners when they see the same terms used by Nikon, for example. I modified the article and added a separate paragraph on “angle of view” and its difference relative to “field of view”. Unfortunately, Nikon uses both terms interchangeably all the time – see their technical data for every lens, where they define “maximum angle of view” differently for each format. In reality, the angle of view should be a single number and field of view relative to format should be defined separately. I think they did this to avoid additional questions, but that certainly creates confusion. Please see the updated article – I hope it now makes more sense and is correct per your comment. Looks good. Your corrections read well in the sense that I meant. My eyes were opened to this issue when I saw the video link that I posted. I, too, have noticed that the camera manufacturers are quite sloppy in their wording. It reveals (unfortunately) how much they set a premium on a simple message. I am sure that their lens developers know the difference. At least the term “crop factor” is correctly chosen, since that is the real difference between FX & DX. I came across this issue quite recently too, and was intrigued by the fact that even Wikipedia says that FOV and AOV can be essentially used interchangeably. There is a mass of confused information about this subject on a multitude of websites that I’d usually turn to for the correct answers. Optics info sites etc. Of course all of these contradictions out there are further exacerbated by a new term which people seemed to have coined so that they can sit on the fence: Angular field of view. Nassim, I like your assertion that FOV is an angle that is based on both the lens and the camera, whereas AOV is simply the lens. However I note that the majority of the mathematical examples out there define the calculation of AOV to be 2 ArcTan( d / (2f)). Since the formula contains d, defined as sensor width, what you are saying is that this is actually the formula for FOV not AOV. This would only be the formula for AOV if it was always 2 ArcTan( 36 / (2f)) because manufacturers are always talking in full frame terms? There’s definitely more than a few arguments out there that suggest FOV should be a measurement of distance at a given focal point, rather than an angle as you have suggested. This got me thinking a bit more when I read the specs for a Canon EF-S lens that stated its AOV. In that instance, by your definition, AOV would be the correct usage, since an EF-S lens doesn’t actually have an AOV that’s greater than its FOV, unlike the situation where a full frame EF lens is used on an EF-S mount. Ultimately the whole thing becomes so confusing that I can see why people just seem to have given up and use whatever comes to mind when they are writing! Excellent article on a tricky topic for beginners! A. Carl Zeiss Planar 80mm, Nikon adapter, and Nikon D610 FX camera. B. Tokina Macro 100mm lens and Nikon D610 FX camera. C. Tokina Macro 100mm lens and Nikon D200 DX camera. Thus I am inclined to suggest, that in case A, a focus distance is increased also (60mm/35mm). Thanks so much for having posted this article. I had been confused about “effective focal length” and “field of view”. I’m using a crop sensor camera with my dad’s old full frame (film) lenses. My main takeaway: cropping the sensor does not change focal length and. as f is a proportion of opening to focal length, the f doesn’t change either – just FoV. So I expect a DX 50mm will give me the same FoV as a Fx 50mm – the DX will just be lighter and (probably) cheaper. Good to know/understand! Thanks again! A lot of years have gone by since you wrote this article. And it is an excellent article and really hits the nail on the head. No issues at all. But in today’s digital world, companies like Olympus, Fuji, Panasonic, Sigma and maybe a couple of others make a big point that they are manufacturing lenses specifically to cover their respective formats. If I own an Olympus Micro Four Thirds, and I buy an Olympus 50mm lens which according to Olympus is designed for the Micro Four Thirds system, then why is it not just that a 50mm lens in all respects. Why does it become a 100mm lens when mounted to the camera. And I do understand that it still has all the ingrdients that make it a 50mm lens but becomes a 100mm lens on the cropped sensor. It would seem to me that Olympus in this case or Fuji in their case had a chance to start over and call a spade a spade. I think the industry has made some serious mis steps in physcially designing and naming thier lenses. In other words I don’t think a user should mount a 50mm lens on the camera and call it a 75mm or 100mm. There has to be a better way. May engrave 50mm being used as……blah blah blah. Hi Nasim. Good article. I was actually trying to answer a slightly different question, and it’s hard to know what to Google for the right results. Maybe you could add a bit on to cover this? I understand 50mm equivalents from film SLR days. I love digital compacts because they’re so portable, currently using a Canon SX280HS. I’ve just bought a used EOS-M for a video project but also like the idea of that big fat sensor for some quality stills! This summer I went to Wimbledon with the SX280 and got some decent pictures for a point and shoot. On the small courts at Wimbledon you’re really close to the action, and looking at the image properties the maximum zoom I used was 220mm equivalent. The EOS-M 18-55mm is only 88mm equivalent. So I wondered, although I can crop the image after on the PC, how many MP will I lose trying to make up for a lens with lower zoom? Keeping it simple, say I had taken a picture on a 20mp sensor and 100mm equivalent lens, and wanted to get as close as having used a 200mm lens, in post processing do I end up with a 5mp? I’m thinking if I double focal length from 100 to 200mm I am effectively taking 50% off both width and height, giving me only 1/4 number of pixels to play with. Is that right? Or maybe it’s 10mp left, or something else entirely? I think your descriptions of field of view are slightly misleading. You give four examples, stating to note the difference. There is in fact no difference in the field of view. Each of the four rectangles is the same size. However the content that is captured in that field of view varies based on the focal length you use. The focal length is related to angle of view, so using a short focal length – ie. wide angle lens / wide angle of view – means a wider view of the scene is captured within the field of view. In my description, “wider view of the scene” is the content captured within the field of view. But if I put a “long lens” – ie. longer focal length / narrower angle of view – then I capture less of the “view of the scene” – but I enlarge it onto a field of view that is exactly the same size as my previous shot. It is the content – the view of the scene – that is enlarged onto my field of view. Thank you for your precise articles. I have a question regarding Nikon lens focal range specification on DX versus FX lenses. I have two 35mm Nikon lenses. One is dx and one is fx. Am I correct in understanding that the 35 mm dx lens on a crop sensor camera will provide the same field of view as the 35 mm fx lens on the full frame sensor camera? I wish to use canon EF lens on my Sony alpha A7R. I want to know about the quality of photos.